Arrow sudoku is an absorbing sudoku variant, with lots of subtle logical rules that can be applied to help solve the puzzle. As with normal sudoku you must place the numbers 1-9 once in each row, column and 3x3 box. However the grid also contains arrows which give the puzzle its distinctive name and look. The number in the circle at the start of each arrow is the sum of the numbers along the body of the arrow. This sets up an intriguing interplay between the head and body of the arrow, and indeed often between different arrows in the grid too. By using standard sudoku solving logic combined with the novel types of logic introduced by the arrows, you will be able to find the unique solution for each puzzle (no need to ever guess). 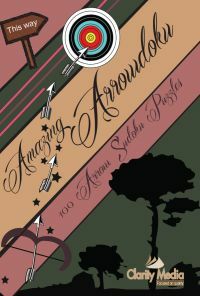 For anyone who likes sudoku but is looking for a different or tougher challenge, then this collection of 100 arrow sudoku could be just what you're looking for! How to get started with arrow sudoku? The hardest part with arrow sudoku puzzles is getting started - because there are far fewer numbers at the beginning of the puzzle, you will probably start off by looking at the arrows rather than the numbers. There are various pieces of logic you can use as part of your solving strategy for arrow sudoku. The simplest is this: the circled square at the top of each arrow cannot contain a number lower than 2, because the minimum arrow length is 2, and those two squares can run diagonally. If an arrow of length 2 has both squares along the body of the arrow in the same region, then the circled cell must be at least 3. If it has a body of length 3 and all three squares are in the same region, then the minimum value for the circled cell is 6: since 1+2+3 = 6. 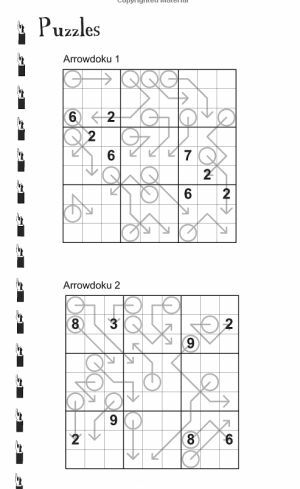 This can actually be very useful and quickly whittle down the options: for instance, look at the sample puzzle shown to the left in Arrowdoku 2. Look at the circled arrow in the top right box that contains three squares in the body. We know that the circled square must contain only 6 or 7, so those can be written in as candidates. Therefore the other two squares along the path can have the candidates 14 and 134 written in them respectively. The above is typical of the interesting logic and feedback process in solving arrow sudokus: the values in the head of each arrow, the circled cell, impact the values along the body, and vice versa. Another very simple piece of logic is that any square along the body of an arrow cannot contain a 9. This can often be useful to help you get started too. The bottom line is that by focusing on arrows at the start you can usually write fairly high values into the circled squares as candidates, and fairly low values as candidates for the squares along the body of each arrow. There are various subtle and interesting rules that can be used to solve arrow sudoku in addition to these: part of the joy of arrow sudoku is to find these out as you go along. But rest assured that you never need to guess when solving these puzzles, there is always logic you can use. Enjoy these arrowdoku and if you get stuck, remember the answers are at the back if you need a sneak peek!